Vallee Scholar Christopher Mason (Weil Cornell Medicine) is one of a number of scientists who have been working on the NASA Twin Study. Scott Kelly spent a year in space, while his identical twin Mark, also an astronaut, remained on Earth. 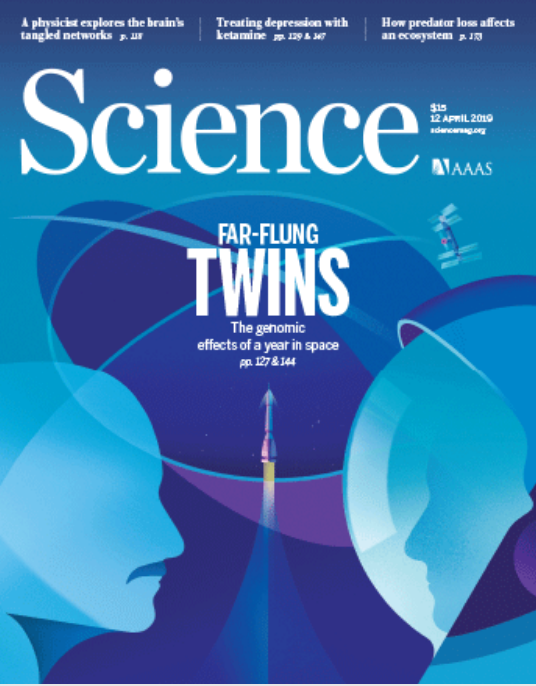 The results of the multiple experiements performed by and on them were published as the cover article in the journal Science this week (Vol 364, Issue 6436, 12 April 2019) and made news around the globe. Chris Mason talks about the results here. Space is the final frontier for understanding how extreme environments affect human physiology. Following twin astronauts, one of whom spent a year-long mission on the International Space Station, Garrett-Bakelman et al. examined molecular and physiological traits that may be affected by time in space (see the Perspective by Löbrich and Jeggo). Sequencing the components of whole blood revealed that the length of telomeres, which is important to maintain in dividing cells and may be related to human aging, changed substantially during space flight and again upon return to Earth. Coupled with changes in DNA methylation in immune cells and cardiovascular and cognitive effects, this study provides a basis to assess the hazards of long-term space habitation. You can read more about the study in the New York TImes or The Guardian.